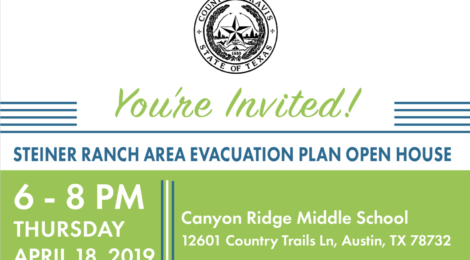 Travis County has scheduled an open house for April 18, 2019 at CRMS 6-8pm (see details HERE), to present evacuation improvement options in Steiner Ranch. The open house is expected to finally present all the information requested by our community including a traffic study for Route F. The open house will present evacuation plans as well as specifics of the route options (B, F, G). Some types of information will be specific to route F as it is proposed to be an “open road” (meaning for every-day use). The County has previously indicated it recommends option F based on its utility. This open has also raised significant concerns from many residents living near Flat Top Ranch Road related to the daily traffic implications and associated concerns. You are strongly encouraged to attend the open house as it will be a chance to learn about the impacts of the proposals and ask related questions directly to the experts from the County. Answers to most questions should be available at the open house including the results of a traffic study for route F.
If you have feedback on the proposals, especially after attending the open house or reviewing the materials, we encourage you to contact the County. The County is the ultimate decision makers on this issue; SteinerRanchEvacRoute@gmail.com. SRNA has worked to help ensure that all options are explored carefully and that community questions get answered prior to any final decision on the proposed options. Over the past months we have communicated questions and concerns we are getting from the larger community to Travis County and encouraging a robust and thorough assessment of options. Questions and concerns documented at our January and March meetings were sent to Travis County for inclusion in their open house preparation; see below to find a collection of recent questions and answers from the County. Daily traffic information should be available and should be in context to number of cars on other roads in the area to get a comparison feel (vs. raw numbers). TNR: A very detailed traffic study was performed and a final document will be available for review at the Open House. Option F: Major concerns on trail impact – what is the impact and will you re-create the trail system? Can you super-impose the trail and propose new trail. The trails are heavy used and a key asset for folks in this area. TNR: A SRMA board member requested Travis County review the trails and Route F. That review is underway. Speed limit and speed mitigation / limitations will these be the same as Flat Top or alternate? Also, will there be limits on large vehicles, such as by weight, etc. TNR: Speed limit is set by a standard method and will be similar to existing traffic speeds. We have not looked at traffic limitations, but will look into that possibility. Could you share the impact assessment regarding real estate values. TNR: We do not provide real estate valuation guidance or appraisal regarding private property. However, in reviewing the Route F location, it is noteworthy that: (a) the closest home in the neighborhood (north of the route) is approximately 175’ away from the proposed new roadway pavement; and, (b) nearly all other residences in the immediate area are located much further from — and at a different elevation than – Route F. To minimize potential impacts – however nominal – to the few proximate homes, Travis County anticipates installing a visual barrier with vegetation and/or an earthen berm along the northern side of Route F. Finally, residential property values can (and often will) include consideration of emergency access and other safety-related issues. Will you address the big picture of evacuation plan and how it works and how any of these solutions really impact the bottom line for various emergency scenarios. A specific scenario (not the only one but one of interest) is for fire south of the Quinlan Park Rd. / UT intersection. TNR: Neighbors in the south part of Steiner will have options in the event of a fire, shelter in place, evacuation to a refuge or evacuate as directed by the event Incident Commander. An exit in the NW area of Steiner Ranch is beneficial to southern Steiner as a resident can avoid traveling through the northerly Quinlan Park Road & Steiner Ranch Blvd. intersection or the Quinlan Park Road & RM 602 intersection. Specific question on modeling scenarios w/ various directions of. Wind, etc to look at all contingencies – would be good to setup something like a demo to show. Is there a way to preclude future development (private sale , etc.) on the Travis County owned land. e.g. we don’t end up w/ commercial there in the long run. TNR: Travis County has no plans for commercial development at the West Service Center. We are not aware of a scenario that would allow commercial development on this Travis County property. Can you please summarize the mitigations including any berm, wall, etc. envisioned or considered. TNR: An earthen vegetated berm is under consideration alongside Route F. Specific locations will be determined based on final elevation and location with regard to homes. Can construction near homes be mitigated – what will be done to minimize disruption to homes; e.g. limit construction to 9-3pm, no weekends… etc. TNR: We are open to discussion regarding work schedule and project schedule. Many items requiring coordination will be considered when we move towards finalizing a route including neighborhood concerns.